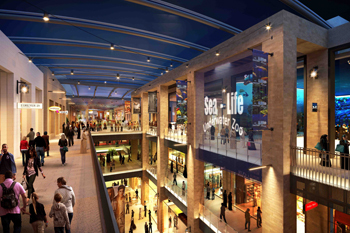 An artist’s impression of Marassi Galleria. Eagle Hills Diyar, developer of the urban waterfront project Marassi Al Bahrain, has signed up with Dubai’s Emaar Entertainment to bring a bumper family entertainment centre to its Marassi Galleria shopping and lifestyle destination in Bahrain. The 13,200-sq-m centre marks the first major leisure and entertainment (L&E) attraction by Emaar Entertainment in Bahrain, and is set to become the largest entertainment element of any mall in the country. Emaar Entertainment is the premium provider of L&E experiences, with its portfolio including KidZania Dubai, Dubai Aquarium & Underwater Zoo, Dubai Ice Rink and Reel Cinemas in Dubai. The Underwater Zoo alone covers an area of 2,400 sq m and will be the first such aquatic journey in Bahrain. Another exciting first in the park will be an eco-friendly mountain climb, situated on the rooftop of Marassi Galleria, with natural sun rays and jungle atmosphere, plus a nature-themed dining area, said a statement. Facilities include virtual reality, a luxury cinema, extreme free-slide, nature climb, a kids play zone, an aquarium, zip-wiring, trampolining, a Digital Family Entertainment Centre. The 200,000-sq-m Marassi Galleria will be linked to two luxury hotels and serviced residences projects – The Address Marassi Al Bahrain and The Address Residences Marassi Al Bahrain operated by The Address Hotels + Resorts, and Vida Marassi Al Bahrain and Vida Residences Marassi Al Bahrain by Vida Hotels and Resorts. Spanning 875,000 sq m, Marassi Al Bahrain is being constructed on the northern shores of the masterplanned ‘new city’ of Diyar Al Muharraq, forming a key luxury component of Bahrain’s largest private urban project.